Hong Kong cinema deliverying early 80s gunplay, violence and grit versus Hong Kong cinema delivering Coolio and Aaron Kwok on fast bikes and in fast cars that go vroom vroom. 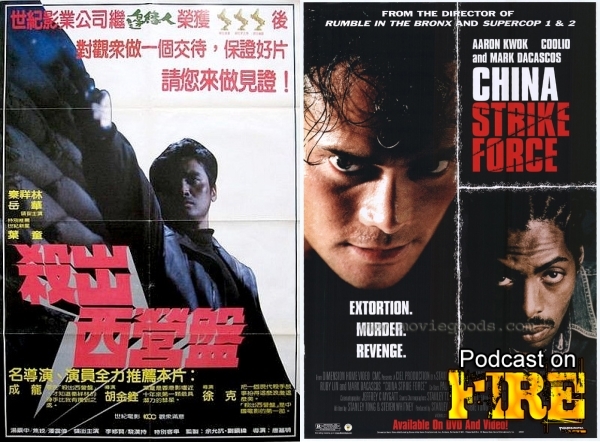 This week, the reviews of Terry Tong’s tough, gritty and violent Coolie Killer from 1982 and Stanley Tong internationally flavored actioner China Strike Force. With Kenny B Paul Fox of the East Screen West Screen podcast. Plot: Young Cops, Darren (Aaron Kwok) and Alex (Lee Hom-Wang) are part of an elite group known as Team 808, their objective is to stop all international drug smuggling into China. Add Tony Lau (Mark Dacascos) the son of Hong Kong crimelord Ma (Lau Siu-Ming), Tony has hooked up with a street wise american coccain dealer – Coolio (rapper/crap actor Coolio). Tony and Coolio plan on bringing cocaine against Ma’s orders. The next Cast From The Past (a series of shows lost from our iTunes feed and website) from 2008 features Stoo, Kenny B and Adam Torel. Talking last movies watched (including Mad Detective), Thailand’s Chocolate where disabilities are fight concepts, listener questions and the big theme: Guilty pleasures. Contact the show via email at podcastonfire at googlemail.com, on our Facebook page and Facebook group (NEW) or Twitter (@podcastonfire, @sogoodreviews) and SUBSCRIBE to our iTunes feed. We are also featured on All Things Film, a collection of like minded Film, Cinema, TV, Geek and Cult Podcasts.